Flyers center Sean Couturier tips the puck past Pittsburgh defenseman Jack Johnson and toward goaltender Matt Murray during the third period Monday. The Flyers’ 10-game point streak came to an end as they dropped a 4-1 decision Monday to visiting Pittsburgh despite firing 51 shots, including a franchise record 28 in one period. Pittsburgh goaltender Matt Murray has been very mediocre this season, but he made a career-high 50 saves Monday and was the game’s best player. “He played unbelievable -- on the road and facing a team that’s able to create the way they can,” Penguins center Sidney Crosby. “I thought we played great,” said Flyers defenseman Ivan Provorov, who had eight of the Flyers’ 51 shots but was minus-3 in the game. “We played hard all 60 [minutes], played with the puck, had a lot of traffic at the net. It was just one of those games we just couldn’t get one behind him” until the waning minutes. Yes, his goal was because of a fortuitous bounce – he was all alone and the puck bounced to him – but Crosby continued to be a Flyers killer. He had a goal and two assists, giving him 40 goals and 97 points in 65 career games against the Flyers. 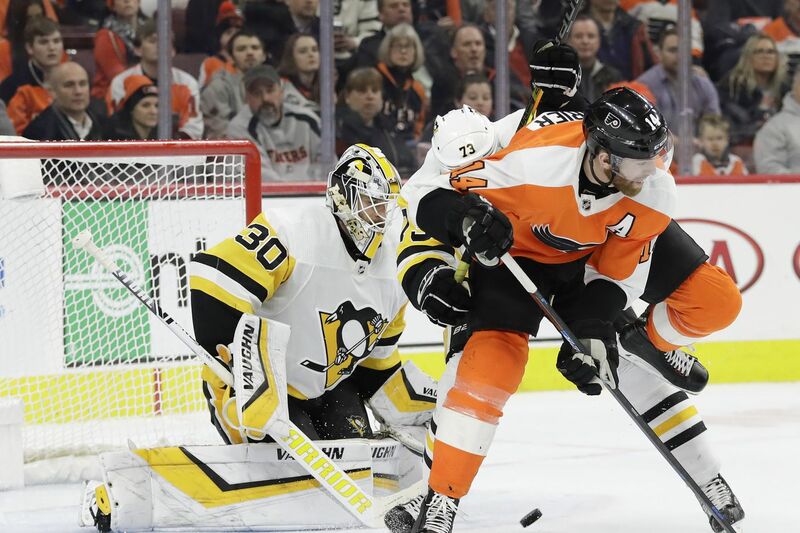 Lucky bounce or not, the Flyers’ failure to have a defender in the same area code as Crosby on his goal was their biggest blunder of the night. The NHL uses video review for offside, and maybe it should add it for some instances when a ref questionably blows his whistle. We give you Nolan Patrick’s disallowed second-period goal as an example. Travis Konecny’s shot bounced off Murray’s glove and Patrick knocked in the rebound to cut the Penguins’ deficit to 2-1. But referee Kyle Rehman lost sight of the puck and blew his whistle a split second earlier -- apparently believing Murray had gloved Konecny’s shot -- and the goal was disallowed. If a ref blows his whistle and the players stop playing and their stoppage could have had a bearing on a goal then being scored, the tally should not count. But in this case, the players stopping at the whistle had no bearing on Patrick’s goal. In instances like this, a goal should count if a video review shows that the whistle was bogus. The NHL should consider adopting it. After all, the idea is to get the play right. The Flyers, having lost their most meaningful game of the season, play in Minnesota on Tuesday. Will they be spent from playing in such a draining, emotional game against the hated Penguins? Or will they benefit from being able to play right away and have a chance at redemption? With 26 games remaining, the Flyers are eight points behind the Penguins for the final wild-card spot. They cannot afford too many more losses or they won’t be playing many more meaningful games in the last two months. Give the Flyers credit for a 9-0-1 run that enabled them to sneak back into the playoff hunt, but they are running out of time. Evgeni Malkin, the Penguins’ star center who returned to the lineup Monday after missing five games with an upper-body injury, faces a possible suspension Tuesday. The NHL’s Department of Player Safety will have a hearing with Malkin on Tuesday for his high sticking/slash of Michael Raffl late in Monday’s game.